Embarking this week over Thanksgiving, is what sounds to the Courtesan, like one of the biggest oxymorons of dark culture. Goth Cruise, sailing through the sunny, happy seas of the Mediterranean carries a bunch of dark lords and black-clad divas through the waters. A subject of a an IFC documentary, the Goth Cruise has characters like "Resident Evil" as perhaps a replacement for "Julie" or other perky cruise director. Sunscreen-devoid shipmates adorn corseted, high-heeled or other cruise-appropriate outfits to stroll through the casino or midnight buffets. Be careful not to catch your lace sleeve on the railings little buddy! For more information, see their website. Decorated some sugar skulls, create an elaborate altar with flowers, bake some sweet bread inthe same of body parts, and honor your loved ones. 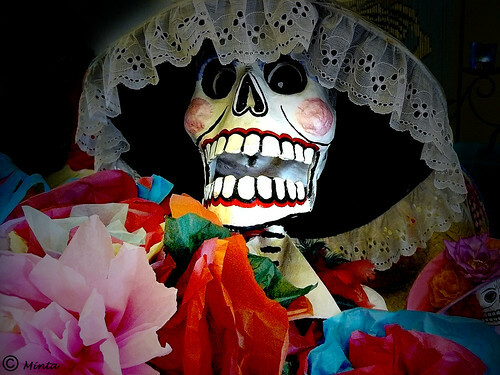 Dia de los Muertos is a A holiday celebrated mainly in Mexico, the U.S. and Canada. Some of the beautiful crafts associated with the holiday are catrinas and the tiny dioramas featuring scenes of the dead. Oaxaca, Mexico is home to one of the biggest celebrations, you can learn more here. Bakeries and restaurants around North American may host some special menus and baked goods tonight in honor of the day. Several children's museums are hosting activities this weekend to educate about the meaningof the holiday as well. Check your local listings.